You know you’re from Alabama when. . . Check out the second installation of You know you’re from Alabama when. . . by clicking here. 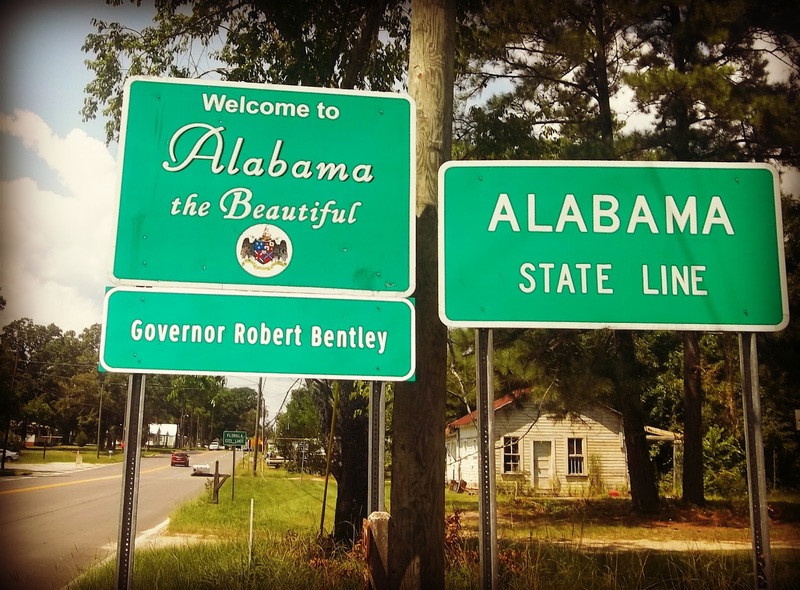 My family has lived in Alabama for the past five generations, and I have a deep and entrenched love for this state. Alabama is a wonderful place to call home with a rich history and a unique culture. From our accents to our food to our zeal for football rivalries, we could be considered by most to be a little quirky. I came across this list the other day and it illustrates that quirkiness so well that I couldn’t stop laughing. So, I hope y’all enjoy reading it as much as I did. You have a party whenever Alabama plays Auburn in football. You go to Gulf Shores every summer. We’ve always went to Panama City, FL instead. You call the Atlanta Braves baseball team “us” like they’re actually from Alabama. You have family who would much rather visit Florida than California. A soft drink isn’t soda, cola, or pop, it’s a coke. You call it a buggy and not a shopping cart. You’ve said “fixin to”, “might could”, or “usetacould” in the last week. You can properly pronounce the following Alabama towns: Arab, Eufaula, Opelika, Loachapoka, Bayou La Batre, and Oneonta. You know exactly what chitlings and mountain oysters are, and though you may not, you know someone that enjoys them. You think that people who complain about the heat and humidity in other states are sissies. You aren’t surprised to find rental movies, groceries, ammunition, and live bait all in the same store. People actually grow, eat, and like okra. You measure distance in minutes and hours. You’ve ever had to switch from “Heat” to “AC’ in the same day. You know what “cow tipping” and “snipe hunting” are. You know whether another Alabamian is from east, west, or middle Alabama as soon as they open their mouth. Visiting Wal-Mart is a favorite past time. You think everybody from up north has an accent. There is no such thing as tea. . . it’s sweet tea. If a single snowflake falls, the town is paralyzed for three days, and it’s on the local news as a news flash every 15 minutes for a week. All grocery stores will be sold out of milk, bread, bottled water, toilet paper, and beer, and people will be on the corner selling “I survived the blizzard” t-shirts. Not to mention, that all the schools will be closed at even the slightest possible chance of snow. Your directions include “when you see the Waffle House” or “turn on the dirt road”. You say “sir” or “ma’am” if there’s even a chance someone is thirty seconds older than you. There is nothing but country, gospel, and classic rock on the radio. A tornado warning siren is your signal to go out in the yard and look for a funnel cloud. I am, unfortunately, so guilty of this one. Almost everyone you know is Baptist, Methodist, or Pentecostal. A Mercedes Benz isn’t a status symbol. A Chevy Silverado Extended Bed Crew Cab is. You know everything tastes better with Ranch salad dressing. Krispy Kreme doughnuts are the only doughnuts that exist. You know at least one Bubba, and possibly a few guys named Bo. You don’t assume the car with the blinker light on is actually going to turn in the foreseeable future. You hear complaints of cold weather, and it’s only 60 degrees. Your favorite snack is RC Cola and a Moonpie, boiled peanuts, or pork rinds. You’ve ate at least one of the following (and enjoyed it): fried alligator, fried rattlesnake, cracklin bread, crawfish (and sucked the heads), possum and sweet potatoes, poke salad, potted meat, Vienna sausages, or red eye gravy. You always eat grits with your scrambled or fried eggs. I honestly cannot eat eggs for breakfast without grits. No omelets for me, thank you. You’ve cooked polenta as a substitute for grits while traveling. Wearing an Auburn (or Alabama) shirt to the grocery store on the Saturday after Thanksgiving has resulted in a major argument starting in the checkout line. This has happened to my mom so many times. Really she should just stay home on Iron Bowl days lol. By the way, we’re major Auburn fans. You know what fried loggerhead and fried cooter are. You describe the first cold snap (below 70 degrees) as “good chili weather”. Every festival is named after an animal, a crop, or a food. One of your favorite books as a child was 13 Alabama ghosts and Jeffrey. You can read a little info about Grancer Harrison here – he’s the star of my county’s ghost story that’s featured in the book. You can make a delicious sandwich out of almost any veggie or fruit, mayonnaise, and light bread (ie tomato, pineapple, banana, etc sandwiches). My favorite, by the way, is a banana sandwich (sliced banana between two slices of bread with mayonnaise – give it a try, it’s yummy). You know what the following fruits are and you look forward to when they’re in season: Pawpaw, Mayhaw Berries, Scuplins, and Satsumas. When you hear, “A house divided. . .”, you automatically think of Alabama and Auburn. It’s surprising (and hilarious) how true the list actually is. Especially the one about our overreaction to snow. And just to prove that it does indeed snow here once in a while, here’s a picture taken from the top of our hill in 2010. We actually were snowed in one time (or should I say “iced in”). Check out the Icepocalypse post from 2014. I just loved this! It sounds like people in Alabama are quite a special bunch and where I live (in Yorkshire in England) they feel much the same way. Glad you enjoyed it! It’s amazing how we’re all really so similar no matter where we live lol.